Christmas day on 25th December 2016 saw about 136 devotees gathering to attend the afternoon discourse given by BW Monastery’s Nuns – Venerables Zu Dao, Zu Guang, Zu Hong and Zu Sheng. For starters, Venerable Zu Dao checked the devotees’ motivation for attending the discourse on a public holiday when all could have chosen to be at other places, enjoying other activities with other people. If we were to set our goal as the fourth motivation, we would actually achieve the other three preceding goals. So, do make a wise choice! The Venerable then shared discourses by Master Jih-Chang as well as Teacher on the topic of “How to Listen and Explain the Teachings”. Through Master Jih-Chang’s discourse, we learnt that it is important to have the right attitude towards listening to the Dharma. We must analyse, reflect and review mindfully the teachings while not over-questioning the teachings in a manner of disbelief. We must take note of the specific benefits of listening. If we have the wrong motivation when listening to Dharma or if our hearts are filled with afflictions when doing so, it is only doing more harm than good. Not only will we not be able to internalise the teachings as we are distracted, worst, we may use the Dharma in the wrong way. Thus, we need to empty our vessel of afflictions before listening to the Dharma and have an open mind so that we can become inwardly reflective rather than being critical of others. In Teacher’s discourse which further explained Master Jih-Chang’s discourse, the key lies in contemplation. If we do not value the teachings, we will not be able to connect with it or understand what is taught. With contemplation, we will gain the benefits of listening and avoid the faults of not listening. We need to observe our hearts, align our minds and observe our current mental state before listening. Only then, can we apprehend the root cause of the condition of our minds and address the issue. We should not dwell on our sufferings, or be dominated by our emotions or stay within our comfort zones. Afflictions arise from the greed to this life due to our being totally self-centred in our perceptions and feelings, using this to make judgement in everything. Selective listening or being stubborn and questioning the teachings unreasonably will only lead to us not being able to correspond with it. While listening to the Dharma, we often mistakenly search for connections from our external environment or conditions. Seeing all external factors and their faults is often not one of inward self-reflection. An animated video further brought across a simple point that when things go wrong, it is often most convenient to conclude that the fault always lies with others. Dharma generates wisdom and the mood to persevere in doing good deeds. It helps us to abandon the wrong views and take up the right view of understanding the cause of afflictions. It is a process of self-purification! It is therefore important to remember that virtuous deeds will not bring suffering and likewise non-virtuous deeds will not bring happiness. Every part of the teaching is important and we should yearn to listen to it whole-heartedly. The more we practice the Dharma, the more we will benefit from it. Just like listening repeatedly to the Insightful Praises, we must repeatedly allow ourselves to practice Dharma, bringing our hearts closer to Dharma till we sing a heavenly melody of Buddhahood. Then, we will be able to face our negative karma and see them as the result of our previous non-virtuous deeds, bear with it and stop it from growing further in the future. This, followed by the doing of virtuous actions will bring us on an upward spiral as we plant seeds of happiness for our future. 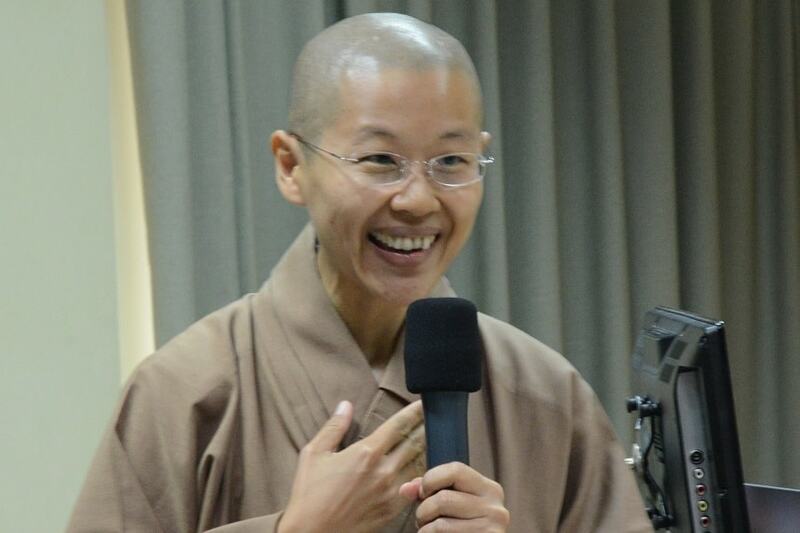 During the discourse, a refreshing role-play by Venerable Zu Guang and Zu Hong also brought to life, how we may erroneously use the Dharma in a way that may harm us if it was used as a critique tool on others rather than on ourselves. So, set our motivation right with our pre-lesson preparation and not fall into a state of contentment towards learning. This will move us onto a higher level of effective learning, an inward-looking process of learning. It was emphasized that everyone should try this pre-lesson preparation before their Lamrim classes. On the journey to class, contemplate on the great benefits of listening, train our minds to empty our hearts and minds of afflictions. If we sustain our driven motivation to attend Lamrim classes like the eagerness to jump into a swimming pool in the burning hot midday sun, we are on the right track! It widens our horizon and allows us to see life as a vast undulating landscape with beautiful mountains and not be distracted by small issues which are insignificant hills in our journey towards enlightenment. Venerable Zu Sheng summarised the discourse with a visual aid, indicating that in order to live a blissful life, we need to learn the Dharma through deep contemplation of its benefits and the application of the teachings on an inward self-reflective purification process. Through these actions, we will gain the merits of a blissful life and eventually attain Buddhahood!